In a bowl mix together meat, onion and garlic. Add salt, ginger and spices and mix with your hands until well incorporated. Form the mixture into little meatballs, about the size of walnuts. Put the meatballs onto a large plate lined with aluminium foil. You can refrigerate the meatballs over night or prepare them right away. They also freeze very vell. Put them into the freezer for a couple of hours, together with the plate. Once frozen, transfer the meatballs into freezer bags. They can be stored for up to three months.When you want to cook them, remove the meatballs from the freezer bag and arrange them onto a plate so that they are not touching each other. Leave them in the refrigerator over night to thaw and proceed according to the recipe. Roughly crush the cumin, corriander and fennel seeds in a pestle and mortar. Add chili flakes and set aside. 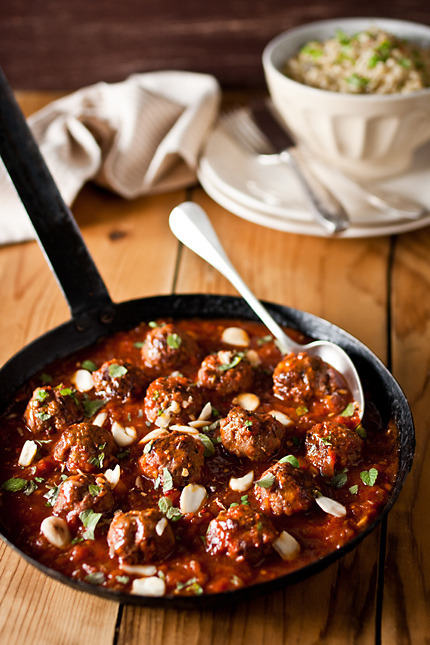 In a large non-stick frying pan, heat a tablespoon of olive oil and fry the meatballs until golden brown on all sides. If necessary, fry them in batches so you don't overcrowd the pan. Remove from pan with a slotted spoon and set aside. Add the crushed spices in the same pan and fry for two minutes, then add onion, garlic and ginger. Cook until the onion becomes translucent. Add tomato paste and tinned tomatoes, water and sugar. Season with salt and pepper and simmer for 10 minutes. Then return meatballs to the pan and cook for another 20 minutes, until the sauce is thickened. Sprinkle with mint leaves, fresh coriander and slivered almonds and serve with couscous or bulghur wheat.